Have you read it? There is quite a buzz about the last line of the book. The Mom loves its comical way of bringing to light that technology will never replace books! And since The Books for Walls Project is also an attempt for The Four of Us to become a little more tech savvy, we got quite a kick out of the book... since we would all rather be reading. Enjoy this great book trailer! 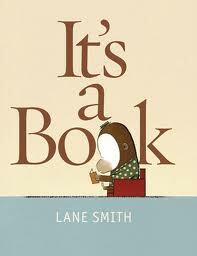 For more on It's a Book, visit Lane Smith's website. More on how the book came to be --read this post by Lane at Curious Pages. I love it! I got a copy this afternoon which I shall send to my computer guru daughter, who is also an avid book reader. And I'll probably get another copy for my grandson so that his Mom can have it too. And ... Thank you very much! We have our copy in hand now and it's a keeper. In fact, we may need to add it to the Over and Over Challenge. It makes The Mom, The Dad and The Sisters laugh and smile. Favorite part of the book: when Monkey gives up on waiting for the Jackass* to finish the book and heads to the library!